Tag line: "No one does stealth like an elf"
Prep & Landing: Operation: Secret Santa was my first experience with Disney’s Prep & Landing series, which began with the aptly-titled Prep & Landing, a television special that aired on ABC in December of 2009. Released a year later, Operation: Secret Santa is a 7-minute short featuring the further adventures of Wayne (voiced by Dave Foley) and Lanny (Derek Richardson), a pair of elves who are part of The North Pole’s elite “Prep & Landing” team, whose job is to sneak in and prepare the houses that Santa (W. Morgan Sheppard) will visit on Christmas Eve, ensuring nothing will get in his way as he delivers toys to children around the world. This time, however, the mission is of a more personal (and highly secretive) nature; after being briefed by their superior, Magee (Sarah Chalke), Wayne and Lanny enter a darkened room, where they find none other than Mrs. Claus herself (voiced by Betty White)! Apparently, she’s planning a very special gift for Santa this year, but needs one vital piece to complete it. So, she wants the two elves to retrieve that piece for her. The problem is: it’s in Santa’s personal workshop, and seeing as it’s close to Christmas Eve, the big guy is spending 24 hours a day in there. Despite Lanny’s worries that Santa will discover them and put them on the “naughty” list, the duo sneaks into the workshop while Santa is sleeping and searches for the item, knowing full well they have exactly 5 minutes before the cuckoo clock on the wall chimes the hour, waking Santa from his slumber. The idea of elves being used to “pave the way” for Santa as he makes his round-the-world flight is a clever one, and I kinda wish I’d seen the first entry prior to watching Operation: Secret Santa. Fortunately, you don’t need to be familiar with the characters or their backstory to enjoy this 2010 short, which is funny (Lanny’s worrisome nature causes him to daydream a “worst case scenario” while the two are mid-mission), smart (the high-tech equipment Wayne and Lanny use includes a device that tells them whether Santa is “Stirring”, or if he’s in a deep sleep), exciting (they have a few close calls in the workshop), and even touching (the final scene, where we see what Mrs. Claus was building, brings the story to a heart-warming conclusion). Alas, after Operation: Secret Santa, only one other short was produced for the Prep & Landing series: Naughty vs. Nice, a half-hour special broadcast on the ABC network in December, 2011. 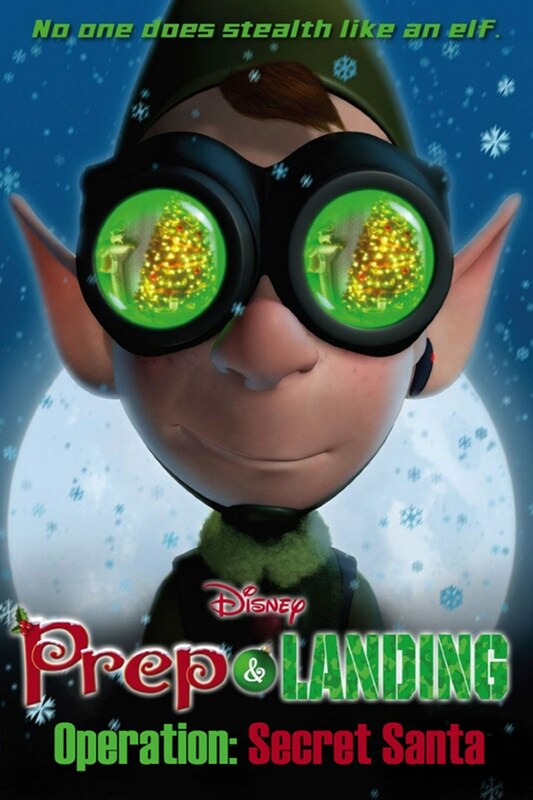 Having thoroughly enjoyed Operation: Secret Santa, I’m looking forward to seeing the other two entries, and I hope, somewhere down the line, that the good folks at Disney’s Animation Studios realize there are still plenty of stories to be told about a pair of elves and their various misadventures.